Gradient analysis is rarely used in studies of fungal communities. Data on macromycetes from eight sites along an elevation gradient in central Veracruz, Mexico, were used to demonstrate methods for gradient analysis that can be applied to studies of communities of fungi. Selected sites from 100 to 3,500 m altitude represent tropical dry forest, tropical montane cloud forest, conifer forest, and their ecotones. From May to October 2010, macromycetes were collected monthly within ten 10 × 10 m permanent plots per site. In total, 672 individuals of 213 species of macromycetes were recorded. Models for richness and diversity for all macromycete and ectomycorrhizal communities displayed peaks in the mid-part of the gradient, and a tendency to increase with elevation, whereas xylophagous fungi displayed a peak in the mid-lower part but tended to decrease with elevation. Cluster and Maximum Likelihood analyses distinguished four communities for both macromycetes and trees, but plant and fungal communities were only partly concordant. Canonical correspondence analysis indicated that macromycete distribution along the gradient is related to slope, relative humidity, soil temperature, soil water content, canopy openness, and litter depth. Spearman’s correlation and regression trees suggested that air and soil temperature, relative humidity, soil water content, canopy openness, vegetation structure and tree species richness were most strongly related to macrofungal functional groups, but these environmental variables were often correlated to the forest type and may not be causal. Variation in the environment along the elevation gradient differentially affected macromycete functional groups. Results from the different methods used in this work were concordant and showed significant patterns. The online version of this article (doi: 10.1007/s10531-011-0180-3) contains supplementary material, which is available to authorized users. The corresponding author thanks the Luquillo LTER for support (NSF grant DEB-0218039) to the University of Puerto Rico and IITF, USDA Forest Service. 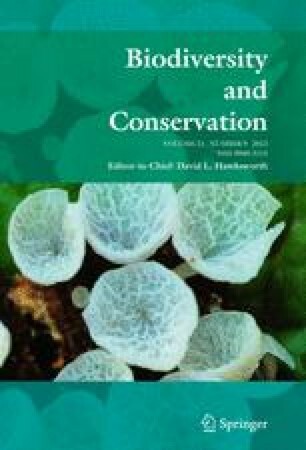 The authors especially thank two Luquillo LTER scientists, Dr M. Willig of University of Connecticut for initial advice, reprints and preprints on metacommunity analysis, and J. K. Zimmerman for additional advice. We thank E. Gándara and M. Cruz for their assistance in the field and with identifications. This research was partially supported by a scholarship to the first author from Consejo Nacional de Ciencia y Tecnología.